Stressed about college? Read this! 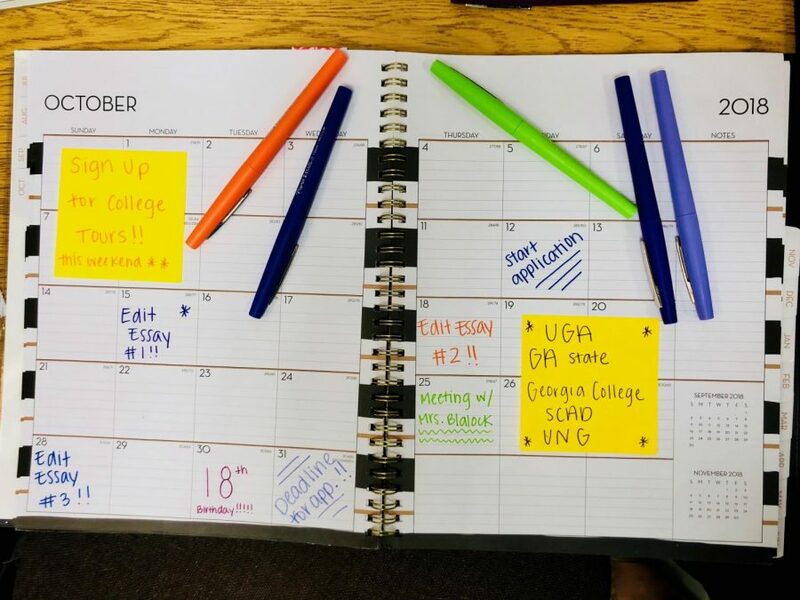 College commonly stresses students out, but they can avoid overwhelming themselves by keeping up with important dates and college information in a calendar or notebook. Students should note which colleges they plan on applying to, as well as events such as counselor meetings and college visits in their planner. As colleges begin to open up their applications, seniors pick their colleges and schedule college visits. The thought of college stresses students and making decisions becomes harder and harder. When students begin their college applications, counselors stand by with all the answers. While seniors try to cram their year full of Advanced Placement classes, 11th and 12th grade counselor Taylor Damico advises that seniors should take a slower paced senior year. “Pick your strengths and try to challenge yourself in those areas and then maybe you can come back down from AP or Honors in another class you may not be as ready for,” Damico said. Stressing out so close to the finish line would disencourage students while they also attempt to fill out their college applications. “I definitely understand wanting to have the rigor and challenging yourself with AP classes and honors classes, but you don’t want to be taking four AP classes your spring semester of your senior year,” Damico said. Once a student starts to make his college decisions, they should research the colleges and know what they want in a school. Location, one important factor, will determine social interactions or how a person would spend time outside of class. The size of a college can determine social interactions or how a student can interact and speak with their professor. Typically at larger universities, teachers assistants lead lectures while the professor conducts his or her own personal research. “It really depends on what factors you think are important. You definitely want to consider location and size just because some people really want that distance and huge university feel, but also others may want to be close to home with a smaller class size,” Damico said. Although students should research their favorite colleges, they should not make a major decision without visiting the actual campus. Once a student explores the school’s campus, they can truly see if the school will fit them best. “Once you step on campus you’ll be able to tell if it’s a good fit for you or not. I would even recommend sitting in a college class to see what it might feel like if you’re able to,” Damico said. Without a college visit, a student may not know what the college experience feels like. A campus visit serves as a test drive for the college and helps the individual realize what he truly wants from a college. “You don’t want to walk on to a campus the first day not knowing or being aware of what the campus had to offer,” Damico said. Seniors should consider these factors when applying to colleges and take each college into careful consideration. “They’re sending out representatives and there will be tables set up so you can talk to the individual colleges as well there will be a Q&A,” Damico said. Students should plan college visits and check when their colleges open applications. If students need any help, they should reach out to their counselor and make an appointment to map out their future plans.